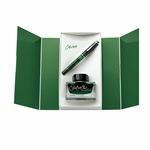 Fahrney's Pens offers an extensive collection of classic pens, luxury gifts, writing instruments, and a selection of the most sought-after fountain pens available online. We carry fountain pens from the most prestigious brands in the industry: Montegrappa, Montblanc, Aurora, Pelikan, and more! Fahrney's also has a plethora of resources available for customers, including our Pen Refills Guide, and Handwriting Analyst FAQ. Being based in Washington, DC, Fahrney's fountain pen experts are accustomed to advising presidents, ambassadors, politicians, dignitaries, celebrities and of course, our terrific customers on which fine writing instrument is the best match for any writing style. Our goal is to get you the right pen for your hand and to keep the ink flowing!